You are here: Home / Small Business Marketing / All My Best Tips and Ideas For Email Marketing! Everything you ever wanted to know about email marketing but didn’t know who to ask! This is the ultimate guide to email marketing for my small business peeps. 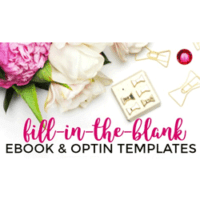 From basic how tos to help with advanced topics, all you need to rock your email newsletters, selling and growing your list… includes a free printable guide! Please note there are affiliate links included! We love advertisers who help to keep this great information free to our readers! 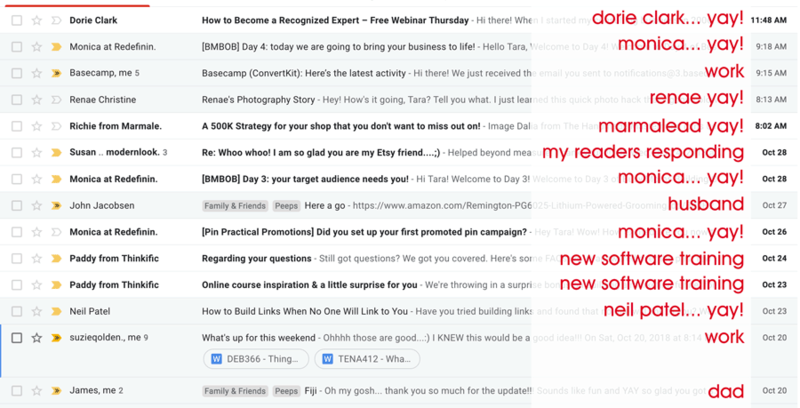 Alrighty then, I feel like there are a lot of weird, random tips and tricks for email marketing, but not a clear, “if you are just starting do this” guide. Here are some considerations when you are starting with email marketing! 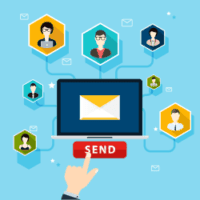 Is my business a good candidate for email marketing? Let’s go right to the start of email marketing and talk about whether you should do it at all! I tried to think of a type of business that wouldn’t benefit, but it is good for everyone … Real Estate Agents, Authors, Etsy Sellers, MLMers, Financial, Local, Online, functionally everyone. But why? Why is it so great? The best part about email marketing is that your reader has given implicit permission to talk to them about your business, yourself and your industry. And you own that list! No algorithm can change and hide you from your customers or clients, you get to decide how to use your list! Should I just use my Gmail, Yahoo etc.? Does the size of my email list determine if I need to use a bulk mailing service? No! This is a really easy one to answer. You should not use your own personal email to send marketing messages in bulk. Yes, you can send a greeting for a client’s birthday or a personal message in your regular email, but if you are going to focus on growing an email list you have to have an email service. This email service will help you to get new subscribers with signup forms, send messages and allow people to automatically unsubscribe. Which is the best email service to use for email marketing? This is a loaded question, as there are about a million of them out there, but here are two ways to go about picking your service! Mailchimp – A good starter services that lets you have up to 1,000 contacts for free. They limit the amount of marketing you can do and eventually you will have to move off of it. If you are just planning on doing a weekly newsletter to start, pick this one! ConvertKit – This is the one I use now. I have used big, huge ones like Infusionsoft & Clickfunnels in the past, but can now safely say that this is the best choice if you are planning to do more with your marketing (like autoresponders, affiliate marketing, etc.) It is $39 a month to start but SO worth it if you plan on doing more complex marketing. Some of my friends use Constant Contact or WiseAgent and that is okay too. If you already have something set up, start there and we can build on that! Can I just use the email that my company gives me (for MLMers and Real Estate Agents)? For some of you, your company says they will provide an email service for you. I find using those internal services super troubling. Usually, deep in the terms of service there is a note saying that if you leave the company, your contacts could be used by others in the company. That is, even if you add people, if you leave, they could continue to market to those people, even as much as leads for other agents or reps. They may also not let you export out of there. If you are going to do email marketing seriously, set up your own system that you can use no matter which company you are associated with! Can’t I just use Facebook or Instagram instead of email? This was a lot more of an issue years ago when Facebook pages actually worked, but now many business owners understand that when you use Facebook or Instagram or Pinterest, THEY own the lists of those people, not you! For example, I have about 1,200 people who “like” my Facebook page. When I post, a tiny fraction of them see my post and even less click through to my blog or offer. On my emails, I can see how many people click to open it and how many people visit the links that I recommend. So on this one I sent 7,442 emails, 1,322 people opened it and 132 clicked a link (those went to my blog to get traffic and to an affiliate offer). I promise! People still open and read email, they aren’t just on social media! Do I have to do double optin? A double optin is where they sign up, then you send them an email and ask specifically if they wanted to signup, they click a link and you are super sure they wanted to be on your list. Any email provider you use will have this feature that you can generally turn off or on at will. I don’t have a double optin since most of my subscribers come from the US and I am very careful to only send them things that they have asked for (more about this later). If you are in Canada or Europe and your primary subscribers will be from there, then yes, I highly recommend you require everyone to do a double optin. Legislation has been passed in those countries with harsh penalties for spamming or using contact information inappropriately. Okay, there are as many different kinds of newsletters as there are snowflakes in the winter! I send a weekly, text based newsletter that links to blog posts and affiliate products. My business besty, Kirsten of Food, Fitness, Finance and Fun, sends a HUGE newsletter with all kinds of links and recipes, and updates and stories. Now don’t get freaked out that yours has to have to THIS much in it! Your newsletter can have whatever your readers like to hear from you! What Should Your Newsletter Theme Be? I have found in the past when my peeps struggled with sending their newsletter, they just had no idea of the theme for it. 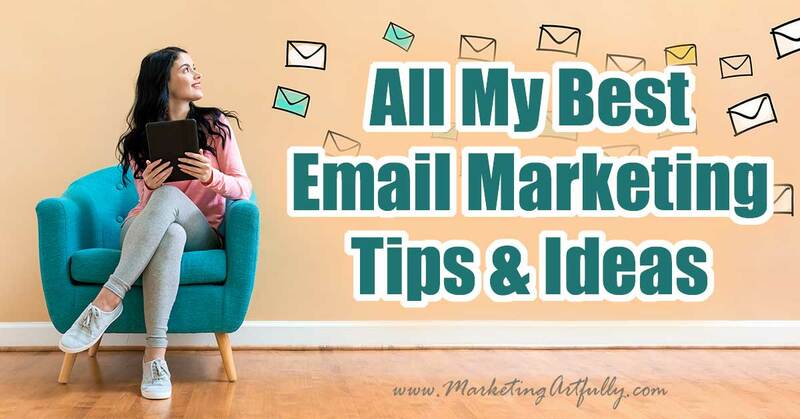 My newsletter theme is to provide helpful, timely marketing tips and ideas to my readers, providing as much free information as possible because they are small business owners. Kirsten’s is to share personal updates, self help content, and talk about her various businesses (Pure Romance, Coaching & Beachbody). I can’t hit every kind of theme, but here are a few to get your wheels turning! Financial – To share current topics about the financial industry, provide helpful advice and talk about products that are available to help your customers. Ecommerce (Etsy) – To share behind the scenes insider info, coupons and sales, and introduce new products. Real Estate – To share the local market updates and changes, local events and happenings, upcoming open houses or homes coming on the market, home improvement tips and recipes if that is something you are into! Local Businesses – To share upcoming events at your location, sales and coupons, new products added, featured customers and products. As you can see, in each it is a mix of interesting content for the reader AND ways for you to increase your sales. Newsletters are not supposed to be “pure” and simply informational, you can promote your products or services in a respectful way! 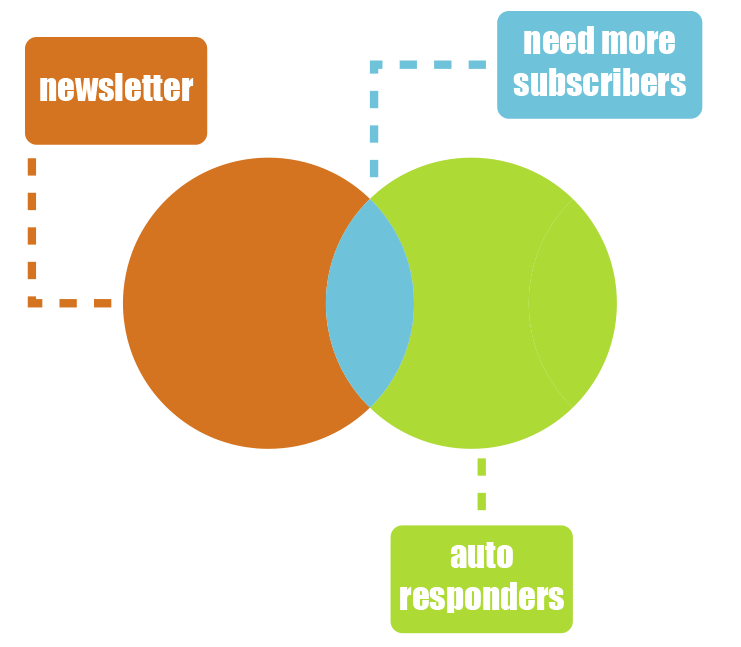 Is Your Newsletter B2C or B2B? Before we get to far down the newsletter road, I think we should stop and talk about whether your newsletter is Business To Consumer (B2C), Business To Business (B2B) or both. I feel like the majority of businesses are selling to consumers but reading marketing advice that applies to a different kind of customer! In your newsletters you can get super personal! Someone buying artwork really DOES want to know what you were thinking as you painted it or really DOES want to know your motivation for opening your store and what you stock in it. They want the stories that are behind the news! This is the kind of newsletter I send. My customers are other business owners exclusively and they are generally trying to find out ways to improve their businesses. They might also want to cut costs, make more money or save time. If you are selling to business owners, you can for sure show some personality and give your own opinions, but you have to always keep in mind the WIFT factor. What’s In It For Them as a business owner! The bonus of being B2B is you can be more of a straight selling newsletter if that is what your readership wants! Some businesses serve both other businesses and consumers. My friend Brian P. is a mortgage banker and he could have two newsletters, one for the Real Estate Agents he works with and one for the consumers he sells mortgages to. If you serve both “sides”, please don’t fall into the trap of thinking you can just have one newsletter and hit both of them at the same time. Consumer interests and business interests are really very different so you have to have two separate newsletters. The Most Important Thing! What Are You Trying To Accomplish With Your Email Newsletter? This is the MOST IMPORTANT THING! If you don’t know what you are trying to accomplish by sending an email newsletter, you will certainly fail! You may have even more things you want to accomplish, but just knowing WHY you are sending message will make sure that you are framing it in a way that will lead you to the desired result. Now, if you are one of my newsletter subscribers, you might be sad that helping is #3 instead of #1. But I am a business and if I don’t make any money, then I stop being able to help anyone because I have to close my doors. So focus on the money first! I am a huge proponent of sending it every week! If you do a monthly newsletter, it is really hard to keep interest levels up and if you send it every day, your readers can get really fatigued. I know that I have opted out of almost every daily newsletter since I have so many important things to do that there really is no one I want to hear from every day! If you are sending a weekly email, you should do a wee bit of research to figure out which day works best for you. I send mine of Friday because my business peeps are not as stressed out that day and it was the one that showed I had the highest open rates. You may have the most opens if you send it on Tuesday or the weekends. What I don’t want you to do is read an article that says “emails have the highest open rates when sent on Wednesdays at 11:30PM” and randomly think that this is the best time for you send it. Sending it out on a consistent day will increase your open rates! If you REALLY can’t manage a weekly email, at least monthly is something that keeps you in touch with your peeps. That said, you would have to pack a LOT of goodness into one message to get your readers pumped up about hearing from you! If I was only sending once a month I would for sure have a monthly marketing theme that I hit on. For example, you could always talk about the upcoming month and it’s holidays and events as your theme. Okay, here are my thoughts about daily. I think your readership will be overwhelmed with messages and you could be overwhelmed with creating that many interesting pieces of content. That said, you do have the benefit of being able to send short, pithy messages that can be sure basic and targeted. For example, I used to get the daily Book Bub bargain emails. It was effective because they were offering me a valuable free book or deep discount and I found some new authors to love. How Many Subscribers Should You Have Before You Start Mailing To Them? One! As soon as one person subscribes to your newsletter you are ready to get started. I KNOW, you are worried that you are going to waste all your “good stuff” when you have only one reader, but seriously, do you want to practice your newsletter when you have one person or after you have accumulated hundreds of people, who maybe have forgotten about you since you haven’t emailed them since they signed up. Alrighty then! Say you have decided to send out a newsletter this week! YAY YOU! Next you need to make sure that newsletter gets opened and consumed by your readers. The way you get your newsletter opened is by having a great subject line! I see too many people send out emails with the subject line… “Marketing Artfully Newsletter”. Is there anything in there for them? Any reason to see it in their email list and think, dang, I have to open that! My most recent email newsletter that got great opens was “4 Easy Things You Can Do To Make More Sales”. That is MUCH more compelling and call to action-y than “Marketing Artfully Newsletter”! And this is my primary email inbox. I have 4 other tabs of emails. So you have to be interesting to stand out! How can you get email signups? Straight up ask them like I do at the top of this page! The subscribers I get just because I ask and they sign up because they think I can help them, last the longest and are the nicest ones to have. They have joined my list because they like my content. sign up for my list here! Popup box. You know about these, they “pop up” when someone is on a website and ask if they would like to join their list. The one thing I would say about these, to get real, engaged subscribers is to delay the popup by a minute or so OR have it only show up after they have visited 2 or more pages. A certain percentage of people will join just because you asked and may not be super engaged readers. In real life. You could have a signup sheet at local events in your store or at an open house. These are super good signups because you have actually met these people and asked them if they want to get your messages. Bribe them. The last easy way to get signups is to bribe them with something that they would want! This is called an autoresponder or drip campaign and we are going to talk about them next! This is middle of the whole email “thing” for me! If you are using a weekly newsletter to talk to people, then you need to get more subscribers onto your list. And one of the easiest ways to get subscribers onto your list is to offer something to them for free! With this campaign, someone requests my free shipping ebook, I “tag” them as an Etsy seller and then send out an email with the Ebook. Easy peasy! Now they are on my list and I can market to them over time! 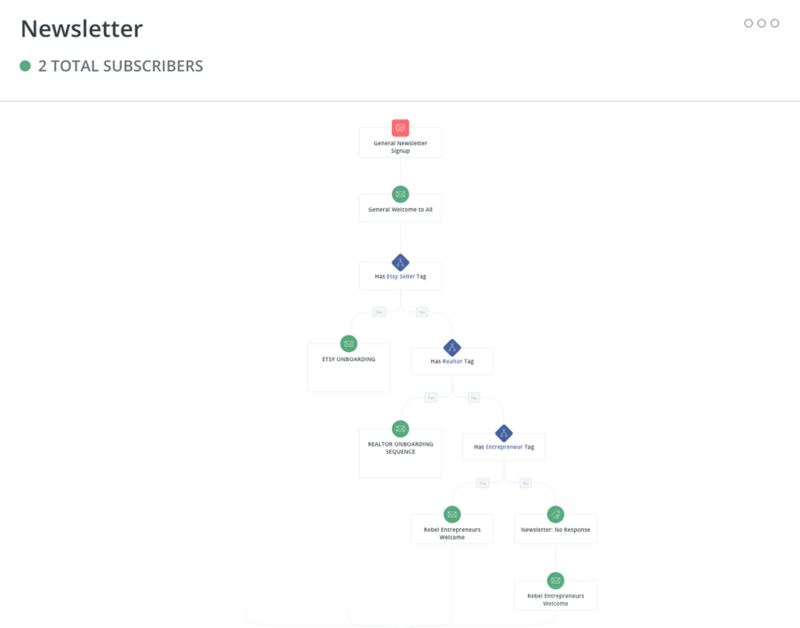 An autoresponder series can be simple like this one, or super hard and convoluted like my newsletter signup series which sorts people into categories and then sends them different things depending on what they pick…. Now, don’t let those little numbers fool you, I just switched over to Convertkit so those are from the last couple of days. I have over 7K people on my newsletter list, sorted into all different kinds of industries! What Should You Give Away For Free? To start your autoresponder series you have to think of something to give away that people might like. This could be as simple as a 20% off coupon or as complex as a huge ebook and recordings! I will be launching some free courses here in the next wee bit and also some more simple worksheets. I find that when I give away something super targeted to my niche, the quality of the subscriber goes up and they stay on my list longer. For example, if you are giving a free guide, 10 Activities To Do With Your Kids, to moms of toddlers, you will probably have a great response. But try to give that guide to moms of teenagers and we will laugh in your face! Pair your freebie to ideal reader. Having a freebie is great, but you won’t get any signups unless you promote it! I put a link to it in relevant pages in the content, but also have a super cool banner that prompts people to signup. 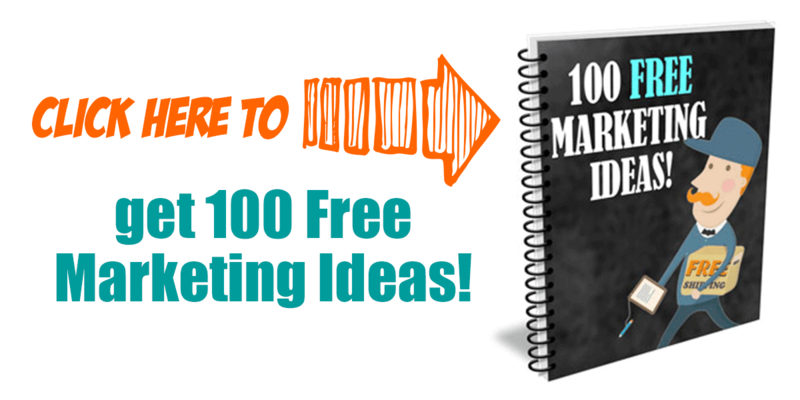 Here is the graphic I use for my 100 Free Marketing Ideas. When I changed to a fun graphic like this, my signups went WAY up! Doing a search for 100 Free Marketing Ideas on Pinterest, there is a link to my 100 Free Marketing Ideas for Realtors, regular 100 Free Marketing Ideas and then a link to my 100 Free Marketing Ideas course on Skillshare. You will want to be promoting your free offer on some kind of social media. That is the end of the formal part of this post! We covered email newsletters, autoresponders and everything in between. But I have been getting SO MANY QUESTIONS about email marketing that I wanted to include them here. 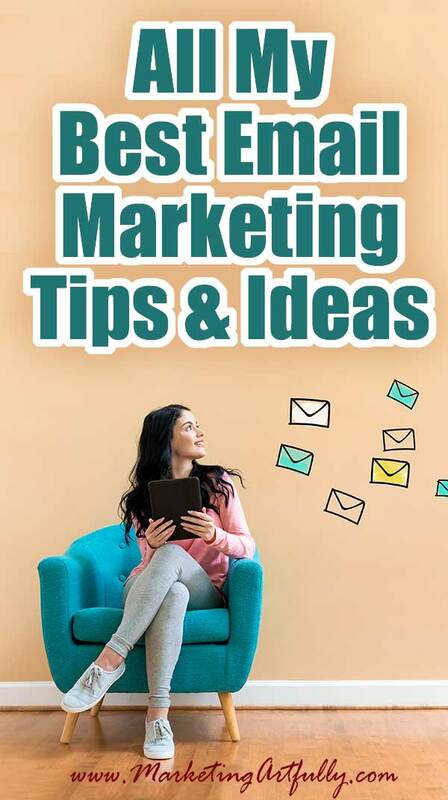 If you are not already doing email marketing, then most of these will be beyond what you need to know know. Get your newsletter started and come back here when you need more help! Big email list or little email list? This one is really hard to answer. I have a client who has an email list in the hundreds and the thought of 7K subscribers like I have seems impossible to her. I follow some big time bloggers and their lists number in the hundreds of thousands and that seems impossible to me. So this is what I am doing. I make goals to increase my subscribers by 10%. So right now my goal is to increase my list by 700 people! Whoo whoo. My client’s goal would be increase her list by 30. That seems much more do-able to her. That said, I wouldn’t want a list of 100K people who didn’t really know me or open my emails. Having a vanity number of subscribers without an engagement won’t do anything to help your business. Should you delete unsubscribes off your lists? In most email providers you can find a list of people who have unsubscribed. One school of thought says that you should periodically go in and delete them. So two things…one being super important! 1. Contact your email provider and ask if they count unsubscribes when they bill you each month! My provider does not count them towards my totals so I will just be leaving them there. If your provider charges you, then delete them for sure and save some money. 2. I like to keep them in case they reengage with me! That way I can look back on their history and have them already tagged and categorized with their right areas. How many subscribers should you get a day? This will depend on how much you are promoting your free offers and email signup. I get about 10 a day from all of my different efforts, BUT that varies greatly by day. Weekends I get hardly and and Tuesday-Friday are my best days. It would be worthwhile to track this for a wee bit so you can know whether to panic or cheer! Is it a good idea to always be giving something away to keep people reading my emails? Hmmmm…. SUCH GOOD QUESTIONS! I don’t think you have to give things away to keep people reading your emails at all. For years I didn’t really give away anything but information. But, people do respond to free offers. What I have done recently is make a deliberate effort to find free things that I believe will help my peeps AND lead to payment for me down the road. For example, one of my favorite bloggers has a FREE Blog Traffic Bonus Guide … when I first “met” her online, I got the guide and it was helpful so I recommend it to my peeps. The next time she opens her classes up for new students I have a chance to make money. This is called affiliate marketing. I don’t do this with all the freebies I give out, but with enough to make it worth my time and effort! What is the easiest way to build a good list? Who are the “right” people to target? A “good” list is a combination of people who know, like and trust you AND people who are willing to support your business financially. I have a friend who accidentally built a large list from a free offer she had that went viral on the “freebies” group boards. It was a nightmare at the time, having to give away so many samples for free AND now she has a list of people who like free stuff, not buyers. So the easiest way to build a “good” list is to know your ideal reader. For me that is someone who likes marketing AND has enough of a real business that they can afford training or tools. More than once I have heard laments from people who started a “cheap” website, like “Dollar Store Decorating” or “Marketing on a Shoestring” who were then blown away that no one would buy anything. Don’t target people who have no money on your list. Onboarding sequences are a series of emails that go out when someone signs up to your list. They are super targeted to that list content and functionally WALK someone through getting to know you and your business offerings. For example, I have a 9 part real estate onboarding sequence for when a realtor signs up for my list. They get an email a week for 9 weeks covering what I think are important real estate marketing strategies. There is no need to create new content for this sequence. Most of the people who join your list for the first time have no idea about you or what you have done in the past. Instead think of getting them “caught up” to your best content! How do I avoid having my emails being spammed? There are “stop” words or spammy words that email providers recommend avoiding. Also you can easily avoid the spam filters by writing naturally and never trying to “game the system”. 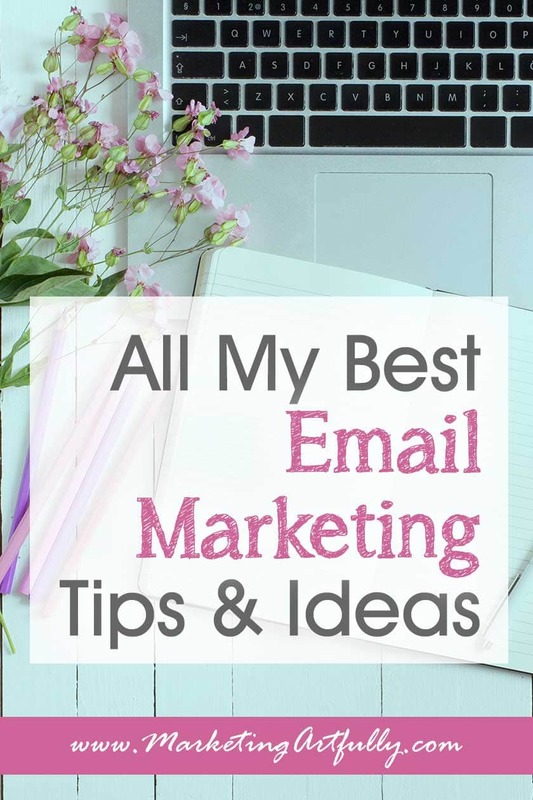 My very best email marketing tips, all in one place… HUGE POST! Now, they could have trouble with the CAPS and exclamation point in the first one, but they will for think that the second one could be spam. A little practicality goes a long way when it comes to figuring out what is and isn’t spam! How can you sort your subscribers? As you get more and more in depth with your emailing, you will realize that not everyone on your list probably wants to read every message. For example, if I write a post about Etsy, the real estate agents generally couldn’t care less. So you want to use either tags or lists to separate your different kinds of subscribers. I feel like the more specific you can get, the more relevant your message will be and the better result you will get! What is the difference between tags versus lists kinds of email providers? I had used a tagging list for years (Infustionsoft) before switching to a list based provider and now back to tags. ConvertKit, the service I use now has tags, and the one that most people start with, Mailchimp has lists. Tags… the reason I like tags is because you can get really specific when you send an email. For a financial planner, she could say, “only send this email to people over 60 who haven’t signed up for medicare yet”. Now, she would have to make sure her email subscribers were sorted that way, but it would be possible. Lists… are much easier. Functionally you say, “everyone who signed up for a free shakeology sample” goes on the Beachbody list. Then you would send messages to the whole Beachbody list at the same time. Tags take more time up front but have great rewards later. Well there you have it, all my best info about Email Marketing! I will be adding more and more info to this page as I get more questions from my peeps. Also, if you have a great resource that you think I think I missed mentioning, give me a head’s up at tara@marketingartfully.com and I might just include it! A super easy way to make sure all the aspects of your email marketing are in good working order! Here are all the considerations that you should review before starting or ramping up your email marketing efforts! Should I just use my Gmail, Yahoo etc.? Can I just use the email that my company gives me? Can't I just use Facebook or Instagram instead of email? What Are You Trying To Accomplish With Your Email Newsletter? What is the easiest way to build a good list? Who are the "right" people to target? Those are all the major considerations about your email list. Please do not get overwhelmed thinking that you have to know all the answers at once!